I really liked my idea! Making beads with leftover polymer clay (available here*) Glaze beads with some gloss glaze (available here*) to give the beads a glossy finish. And stick the beads on toothpicks and place them in some floral foam block while they are drying. Doesn’t sound so bad, right? – WRONG! Maybe you can already guess my mistake. When the glaze had dried, it acted like some kind of superglue, and all the toothpicks were completely stuck. A few of them came out with a little twisting. But most of them just broke off completely. And of course the tips stuck in there for good. 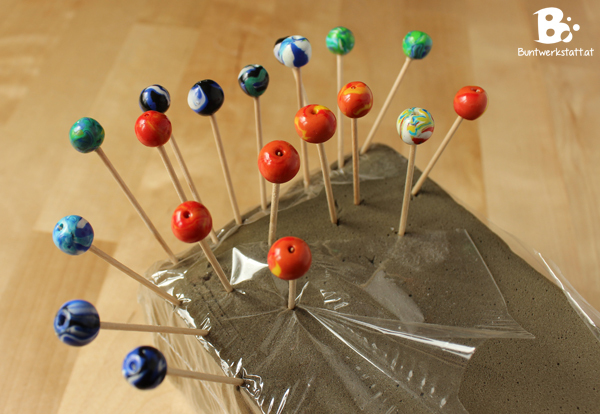 Use some long needles or metal rods, leave a little space between your beads, glaze your beads. 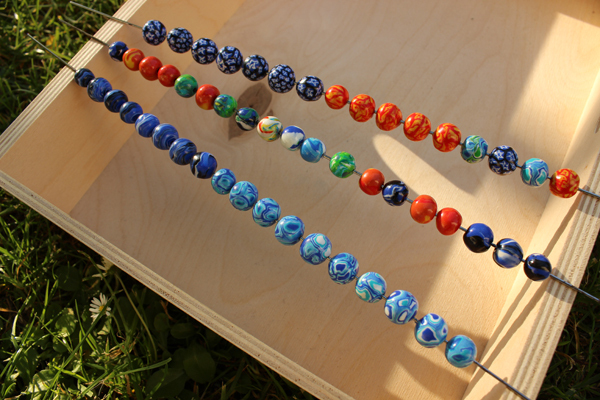 There is even a special bead baking rack (available here*) you can use for baking and glazing your polymer clay beads. If your beads don’t turn out as nicely as you want them to be, there are special tools to help with that. Try a bead starter kit (available here*) or a bead roller.